The Secret Training mix is flavoursome without being over-powering or tasting artificial. Maintaining your energy levels whether you're training, racing or just riding is important if you want to get the most out of your activity. You don't want to be on course for a PB or a good result and find you run out of gas before the finish. So how can you maintain decent levels? Research has shown that by using slow release carbohydrates like Isomaltulose* and resistant starches is possible to support enhanced fat burning whilst maintaining background energy levels (Konig et al 2015). This is all very good but you still need the product. Secret Training have been supplying Pro Tour cycling teams so they set to making a product to satisfy the demands of their team. The fruits of their labour are the 'training mix', slow release carbohydrate and hydration drink mix. Meeting the needs of the riders and making it easily digestible as a drink made for the ideal companion. 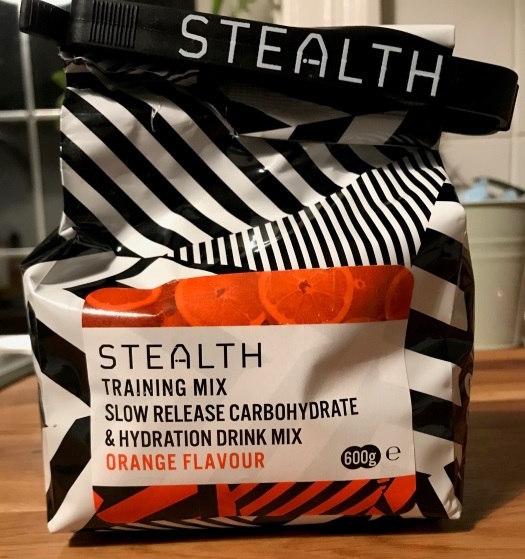 The Stealth Training mix is based around Isomaltulose which due to its specific molecular bond, is fully absorbed albeit slower than commonly known sugars or carbohydrates. This means you still get the full calorific value from the carbohydrates but in a balanced and more beneficial way. The key here is that you avoid spiking your blood sugar levels and to make it more appealing the mix is available in three great flavours, orange, pineapple & watermelon. The proof of concept is that the powder mixes well and easily. I struggle personally with a lot of energy products due to the affects it has on my stomach or my stomach's ability to process them. The Secret Training mix is flavoursome without being over-powering or tasting artificial. The last thing you want is to take a slug of your drink to find there are lumps because it hasn't mixed properly or the taste is too strong/manufactured to be palatable. I have always been impressed with the thought process behind the Brand's products. They are designed with a purpose in mind but also the well-being of the athlete. The bag also comes with a handy peg to ensure you keep the contents in side so there is no waste or potential spillage. The only loss of points would be for the inability to take some of the mix with you as it comes in one big bag but still a good 8/10. *Isomaltulose is formed from glucose and fructose like normal sugar but the bond is broken down more slowly. This is how the spiking of blood sugar is avoided and the associated insulin response. Custom invitation Boxes is available at amazingly low prices with the best work. We have a large number of blank invitation boxes and a bulk of custom invitation all over the USA. Thanks for your good site and beneficial post. You can visit us to find out about medical tourism services with high quality and low expenses. <a href=https://vk.com/casinororg>Ð˜Ð³Ñ€Ð°Ñ‚ÑŒ Ð² Ð¸Ð·Ð²ÐµÑ�Ñ‚Ð½Ñ‹Ðµ Ð²Ð¸Ñ€Ñ‚ÑƒÐ°Ð»ÑŒÐ½Ñ‹Ðµ casino</a> Ð²Ñ‹ Ð¼Ð¾Ð¶ÐµÑ‚Ðµ ÐºÐ°Ðº Ð² demo Ð²ÐµÑ€Ñ�Ð¸Ð¸, Ñ‚Ð°Ðº Ð¸ Ð½Ð° Ñ€ÐµÐ°Ð»ÑŒÐ½Ñ‹Ðµ Ð´ÐµÐ½ÐµÐ¶Ð½Ñ‹Ðµ Ñ�Ñ€ÐµÐ´Ñ�Ñ‚Ð²Ð°. Ð�Ð°Ð´Ð¾ Ð²Ñ‹Ð´ÐµÐ»Ð¸Ñ‚ÑŒ Ð¸Ð³Ñ€Ñƒ Ð² Ð¾Ð½Ð»Ð°Ð¹Ð½ casino Ð½Ð° Ð´ÐµÐ½ÐµÐ¶Ð½Ñ‹Ðµ Ñ�Ñ€ÐµÐ´Ñ�Ñ‚Ð²Ð°, Ð³Ð´Ðµ Ð²Ñ‹ Ð¼Ð¾Ð¶ÐµÑ‚Ðµ Ð¿Ð¾Ð»ÑƒÑ‡Ð°Ñ‚ÑŒ Ð¾Ñ‚Ð»Ð¸Ñ‡Ð½Ñ‹Ðµ Ð±Ð¾Ð½ÑƒÑ�Ñ‹. Ð'Ð¾Ð»ÑŒÑˆÐ¸Ð½Ñ�Ñ‚Ð²Ð¾ Ð¾Ð½Ð»Ð°Ð¹Ð½ ÐºÐ°Ð·Ð¸Ð½Ð¾, ÐºÐ¾Ñ‚Ð¾Ñ€Ñ‹Ðµ Ð²ÐµÐ´ÑƒÑ‚ Ñ�ÐµÐ±Ñ� Ñ‡ÐµÑ�Ñ‚Ð½Ñ‹Ð¼ Ð¾Ð±Ñ€Ð°Ð·Ð¾Ð¼, Ð¿Ñ€ÐµÐ´Ð¾Ñ�Ñ‚Ð°Ð²Ð»Ñ�ÑŽÑ‚ Ð±ÐµÐ·Ð´ÐµÐ¿Ð¾Ð·Ð¸Ñ‚Ð½Ñ‹Ðµ Ð±Ð¾Ð½ÑƒÑ�Ñ‹. Ð£ Ñ€Ð°Ð·Ð½Ñ‹Ñ... Ð¿Ð»Ð°Ñ‚Ñ„Ð¾Ñ€Ð¼ Ñ€ÐµÐ¿ÑƒÑ‚Ð°Ñ†Ð¸Ñ� Ð¾Ñ†ÐµÐ½Ð¸Ð²Ð°ÐµÑ‚Ñ�Ñ� Ð»ÑŽÐ´ÑŒÐ¼Ð¸, ÐºÐ¾Ñ‚Ð¾Ñ€Ñ‹Ðµ Ñ‚Ð°Ð¼ Ð¸Ð³Ñ€Ð°ÑŽÑ‚. Ð*Ñ�Ð»Ð¸ Ð¸Ð³Ñ€Ð¾ÐºÐ¸ Ñ� Ð¸Ð¼ÐµÐ½ÐµÐ¼ Ð¸Ð³Ñ€Ð°ÑŽÑ‚ Ð½Ð° Ð¾Ñ„Ð¸Ð³ÐµÐ½Ð½Ñ‹Ñ... Ñ€ÐµÑ�ÑƒÑ€Ñ�Ð°Ñ..., Ñ‚Ð°ÐºÐ¸Ðµ casino Ð¾Ð±Ð»Ð°Ð´Ð°ÑŽÑ‚ Ð»Ð¸Ñ†ÐµÐ½Ð·Ð¸ÐµÐ¹. ÐšÐ°Ðº Ð¿Ñ€Ð°Ð²Ð¸Ð»Ð¾, Ñ‚Ð°Ð¼ Ñ€ÐµÐ°Ð»ÑŒÐ½Ð¾ <a href=https://www.facebook.com/groups/casinor.net/>Ð¸Ð³Ñ€Ð°Ñ‚ÑŒ Ð² Ð°Ð¿Ð¿Ð°Ñ€Ð°Ñ‚Ñ‹ Ð½Ð° Ð´ÐµÐ½ÐµÐ¶Ð½Ñ‹Ðµ Ñ�Ñ€ÐµÐ´Ñ�Ñ‚Ð²Ð°</a>. Ð*Ñ�Ð»Ð¸ Ð²Ñ‹ Ñ...Ð¾Ñ‚Ð¸Ñ‚Ðµ Ð½Ð° Ð¿Ð¾Ñ�Ñ‚Ð¾Ñ�Ð½Ð½Ð¾Ð¹ Ð¾Ñ�Ð½Ð¾Ð²Ðµ Ð²Ñ‹Ð¸Ð³Ñ€Ñ‹Ð²Ð°Ñ‚ÑŒ Ð±Ð¾Ð»ÑŒÑˆÐ¸Ðµ Ð´ÐµÐ½ÑŒÐ³Ð¸, Ð²Ð°Ð¼ Ð½ÐµÐ¾Ð±Ñ...Ð¾Ð´Ð¸Ð¼ Ñ€ÐµÐ³ÑƒÐ»Ñ�Ñ€Ð½Ñ‹Ð¹ Ð´Ð¾Ñ...Ð¾Ð´. ÐŸÐµÑ€Ð²Ð¾Ðµ Ð²Ñ€ÐµÐ¼Ñ� Ð½Ðµ Ð¿Ð¾Ð»ÑƒÑ‡Ð¸Ñ‚Ñ�Ñ� Ð²Ñ‹Ð¸Ð³Ñ€Ñ‹Ð²Ð°Ñ‚ÑŒ Ð¾Ð³Ñ€Ð¾Ð¼Ð½Ñ‹Ðµ Ð´ÐµÐ½ÐµÐ¶Ð½Ñ‹Ðµ Ñ�Ñ€ÐµÐ´Ñ�Ñ‚Ð²Ð°. Ð�Ð¾, ÐºÐ°Ð¶Ð´Ñ‹Ð¹ Ð¸Ð³Ñ€Ð¾Ðº Ð±Ñ‹Ñ�Ñ‚Ñ€Ð¾ Ñ€Ð°Ð·Ð±ÐµÑ€ÐµÑ‚Ñ�Ñ� Ñ� ÐºÐ°Ñ‚Ð°Ð»Ð¾Ð³Ð¾Ð¼ Ð¸Ð³Ñ€. Ð¡Ñ€ÐµÐ´Ð¸ Ñ€Ð°Ñ�Ð¿Ñ€Ð¾Ñ�Ñ‚Ñ€Ð°Ð½ÐµÐ½Ð½Ñ‹Ñ... Ð°Ð²Ñ‚Ð¾Ð¼Ð°Ñ‚Ð¾Ð² ÐµÑ�Ñ‚ÑŒ Ð¸Ð³Ñ€Ñ‹ Ð¾Ñ‚ Novomatic, IgroSoft, Microgaming Ð¸ Ð´Ñ€ÑƒÐ³Ð¸Ðµ. Ð˜Ð½Ñ‚ÐµÑ€ÐµÑ�Ð½Ð¾ ÐºÐ°Ðº ÑƒÑ�Ñ‚Ñ€Ð¾ÐµÐ½ Ñ�Ð´ÐµÑ€Ð½Ñ‹Ð¹ Ñ€ÐµÐ°ÐºÑ‚Ð¾Ñ€ Ð¸ Ð¼Ð¾Ð³ÑƒÑ‚ Ð»Ð¸ Ñ€Ð¾Ð±Ð¾Ñ‚Ñ‹ Ð¿Ð¾Ñ�Ñ‚Ñ€Ð¾Ð¸Ñ‚ÑŒ Ð´Ð¾Ð¼.Ð'Ñ�Ðµ Ð¾ Ð½Ð¾Ð²Ñ‹Ñ... Ñ‚ÐµÑ...Ð½Ð¾Ð»Ð¾Ð³Ð¸Ñ�Ñ... Ð¸ Ð¸Ð·Ð¾Ð±Ñ€ÐµÑ‚ÐµÐ½Ð¸Ñ�Ñ....ÐœÑ‹ Ð³Ð¾Ñ‚Ð¾Ð²Ð¸Ð¼ Ð´Ð»Ñ� Ð²Ð°Ñ� Ñ�ÑŽÑ€Ð¿Ñ€Ð¸Ð·Ñ‹ ÐµÐ¶ÐµÐ¼ÐµÑ�Ñ�Ñ‡Ð½Ð¾.Ð£ Ð½Ð°Ñ� Ð²Ñ‹ Ð²Ñ�Ñ‚Ñ€ÐµÑ‚Ð¸Ñ‚Ðµ Ð¾Ð±Ð»Ð°ÐºÐ¾ Ð¸Ð·Ð²ÐµÑ�Ñ‚Ð½Ñ‹Ñ... Ð¿ÐµÑ€Ñ�Ð¾Ð½Ð°Ð¶ÐµÐ¹ Ð¸Ð½Ð¾Ñ�ÐºÐ°Ð·Ð°Ñ‚ÐµÐ»ÑŒÐ½Ð¾ Ð¸Ð· Ð¼Ð¸Ñ€Ð¾Ð² Ð˜Ñ�Ñ‚Ð¾Ñ€Ð¸Ð¸, ÐšÑƒÐ»ÑŒÑ‚ÑƒÑ€Ñ‹ Ð¸ ÐŸÑ€Ð¸Ñ€Ð¾Ð´Ñ‹.ÐŸÐµÑ€Ð²Ñ‹Ðµ Ñ„Ð¸Ñ€Ð¼Ñ‹, ÐºÐ¾Ñ‚Ð¾Ñ€Ñ‹Ðµ Ñ�Ñ‚Ð°Ð»Ð¸ Ð½ÐµÐ¿Ð¾Ñ�Ñ€ÐµÐ´Ñ�Ñ‚Ð²ÐµÐ½Ð½Ð¾ Ð·Ð°Ð½Ð¸Ð¼Ð°Ñ‚ÑŒÑ�Ñ� Ð¿Ñ€Ð¾Ð¸Ð·Ð²Ð¾Ð´Ñ�Ñ‚Ð²Ð¾Ð¼ Ð¸Ð³Ñ€Ð¾Ð²Ñ‹Ñ... Ð°Ð²Ñ‚Ð¾Ð¼Ð°Ñ‚Ð¾Ð² Ð² Ð±Ð¾Ð»ÑŒÑˆÐ¸Ð½Ñ�Ñ‚Ð²Ðµ Ñ�Ð²Ð¾ÐµÐ¼ Ð¸Ð· Ð¸Ð¼Ð¿Ð¾Ñ€Ñ‚Ð½Ñ‹Ñ... Ñ�Ð»ÐµÐºÑ‚Ñ€Ð¾Ð½Ð½Ð¾-Ð¼ÐµÑ...Ð°Ð½Ð¸Ñ‡ÐµÑ�ÐºÐ¸Ñ... Ñ‡Ð°Ñ�Ñ‚ÐµÐ¹, Ñ�Ñ‚Ð°Ð»Ð¸ Ñ�Ð¾Ð·Ð´Ð°Ð²Ð°Ñ‚ÑŒÑ�Ñ� Ð² Ð Ð¾Ñ�Ñ�Ð¸Ð¸ Ð² Ð½Ð°Ñ‡Ð°Ð»Ðµ 90-Ñ... Ð³Ð¾Ð´Ð¾Ð².ÐžÐ´Ð½Ð¾Ð¹ Ð¸Ð· Ð¿ÐµÑ€Ð²Ñ‹Ñ... Ñ�Ñ‚Ð°Ð»Ð° ÐºÐ¾Ð¼Ð¿Ð°Ð½Ð¸Ñ� "Ð£Ð½Ð¸ÐºÑƒÐ¼", ÐºÐ¾Ñ‚Ð¾Ñ€Ð°Ñ� Ð² 1993 Ð³Ð¾Ð´Ñƒ Ð¾Ñ‚ÐºÑ€Ñ‹Ð»Ð° Ð² ÐŸÐµÑ‚ÐµÑ€Ð±ÑƒÑ€Ð³Ðµ Ñ�Ð¾Ð±Ñ�Ñ‚Ð²ÐµÐ½Ð½Ð¾Ðµ Ð¿Ñ€Ð¾Ð¸Ð·Ð²Ð¾Ð´Ñ�Ñ‚Ð²Ð¾, Ð¸ Ð½Ð°Ð»Ð°Ð´Ð¸Ð»Ð° Ð²Ñ‹Ð¿ÑƒÑ�Ðº Ð°Ð²Ñ‚Ð¾Ð¼Ð°Ñ‚Ð¾Ð² Ð¿Ð¾Ð´ Ð¼Ð°Ñ€ÐºÐ¾Ð¹ Â«Ð�Ð˜Ð¢.Ð˜Ð³Ñ€Ð¾Ðº Ð¾Ð¿ÑƒÑ�ÐºÐ°Ð» Ð¼Ð¾Ð½ÐµÑ‚ÐºÑƒ Ð²Â Ñ‰ÐµÐ»ÑŒ Ð¸Â Ð¿Ð¾Ð»ÑƒÑ‡Ð°Ð» Ð¼Ð¾Ñ‡ÑŒ Ñ�Â Ð¿Ð¾Ð¼Ð¾Ñ‰ÑŒÑŽ Ñ€Ñ‹Ñ‡Ð°Ð³Ð° ÐºÑ€ÑƒÑ‚Ð°Ð½ÑƒÑ‚ÑŒ Ð²Ñ�Ðµ Ð±Ð°Ñ€Ð°Ð±Ð°Ð½Ñ‹ Ð² Ñ‚Ð¾ Ð¶Ðµ Ð²Ñ€ÐµÐ¼Ñ�.ÐŸÐ¾Ñ�Ð»ÐµÐ´Ð¾Ð²Ð°Ñ‚ÐµÐ»ÑŒÐ½Ð¾ Ð¾Ñ�Ñ‚Ð°Ð½Ð°Ð²Ð»Ð¸Ð²Ð°Ñ�Ñ�ÑŒ, Ð±Ð°Ñ€Ð°Ð±Ð°Ð½Ñ‹ Ñ„Ð¾Ñ€Ð¼Ð¸Ñ€Ð¾Ð²Ð°Ð»Ð¸ Ñ€Ñ�Ð´ Ð¸Ð·Â Ð¿Ñ�Ñ‚Ð¸ ÐºÐ°Ñ€Ñ‚, Ð²Ñ‹Ñ�Ñ‚Ñ€Ð¾ÐµÐ½Ð½Ñ‹Ñ... Ð²Ð´Ð¾Ð»ÑŒ Ð³Ð¾Ñ€Ð¸Ð·Ð¾Ð½Ñ‚Ð°Ð»ÑŒÐ½Ð¾Ð¹ (Â«Ð¿Ð»Ð°Ñ‚ÐµÐ¶Ð½Ð¾Ð¹Â») Ð»Ð¸Ð½Ð¸Ð¸.Ð˜Ð³Ñ€Ð¾Ð²Ð¾Ð¹ Ð·Ð°Ð» ÐºÐ»ÑƒÐ±Ð° Ð'ÑƒÐ»ÐºÐ°Ð½ Ð¿Ñ€Ð¸Ð³Ð»Ð°ÑˆÐ°ÐµÑ‚ Ð²Ñ�ÐµÑ... Ð³Ð»ÑƒÐ¿Ð¸Ñ‚ÑŒ Ð² ÐºÐ¾Ð¼Ð¿Ð°Ð½Ð¸Ð¸ Ð*Ð³Ð¸Ð¿ÐµÑ‚Ñ�ÐºÐ¸Ñ... Ð'Ð¾Ð³Ð¾Ð².ÐœÐµÑ€Ð·ÐºÐ¸Ð¹ ÑƒÑ‚ÐµÐ½Ð¾Ðº Ð¿Ñ€ÐµÐ²Ñ€Ð°Ñ‚Ð¸Ñ‚Ñ�Ñ� Ð² Ð¿Ñ€ÐµÐºÑ€Ð°Ñ�Ð½Ð¾Ð³Ð¾ Ð»ÐµÐ±ÐµÐ´Ñ� Ð¸ Ð¿Ñ€Ð¸Ð½ÐµÑ�ÐµÑ‚ Ð'Ð°Ð¼ ÑƒÐ´Ð°Ñ‡Ñƒ Ð² Ð¸Ð³Ñ€Ð¾Ð²Ñ‹Ñ... Ð°Ð²Ñ‚Ð¾Ð¼Ð°Ñ‚Ð°Ñ... Ð'ÑƒÐ»ÐºÐ°Ð½ Ð¾Ð½Ð»Ð°Ð¹Ð½.ÐžÐ½Ð¸ Ð·Ð°Ð¿ÑƒÑ�ÐºÐ°ÑŽÑ‚Ñ�Ñ� Ð±ÐµÐ· Ñ€ÐµÐ³Ð¸Ñ�Ñ‚Ñ€Ð°Ñ†Ð¸Ð¸ Ð°ÐºÐºÐ°ÑƒÐ½Ñ‚Ð° Ð½Ð° Ñ�Ð°Ð¹Ñ‚Ðµ Ð¸ Ð¿Ð¾Ð¿Ð¾Ð»Ð½ÐµÐ½Ð¸Ñ� Ñ�Ñ‡ÐµÑ‚Ð°.Ð Ð°Ñ�Ñ�ÐµÑ�Ñ‚ÑŒÑ�Ñ� Ð±ÐµÑ�ÐºÐ¾Ñ€Ñ‹Ñ�Ñ‚Ð½Ð¾ Ð² Ð¸Ð½Ñ‚ÐµÑ€Ð½ÐµÑ‚-ÐºÐ°Ð·Ð¸Ð½Ð¾ ZolotoLoto Ð¼Ð¾Ð¶ÐµÑ‚ Ð¸ Ñ‚Ð¾Ñ‚ Ð¸ Ð´Ñ€ÑƒÐ³Ð¾Ð¹ Ð¶ÐµÐ»Ð°ÑŽÑ‰Ð¸Ð¹.Â ÐŸÑ€Ð¾Ñ†ÐµÐ½Ñ‚ Ð²Ð²Ð¾Ð´Ð¸Ñ‚Ñ�Ñ� Ð² Ð½Ð°Ñ�Ñ‚Ñ€Ð¾Ð¹ÐºÐ¸, Ð° Ñ„Ð°ÐºÑ‚Ð¸Ñ‡ÐµÑ�ÐºÐ¾Ðµ Ð¼Ð°Ð½ÐµÐ²Ñ€ Ñ„Ð¸ÐºÑ�Ð¸Ñ€ÑƒÐµÑ‚Ñ�Ñ� Â Ð¿Ð°Ñ€Ð°Ð¼ÐµÑ‚Ñ€Ð¾Ð¼.Ð¢ÐµÐºÑƒÑ‰Ð¸Ð¼ Ñ�Ñ€ÐµÐ´Ð½ÐµÑ�Ñ‚Ð°Ñ‚Ð¸Ñ�Ñ‚Ð¸Ñ‡ÐµÑ�ÐºÐ¸Ð¼ Ð¿Ñ€Ð¾Ñ†ÐµÐ½Ñ‚Ð¾Ð¼ Ð²Ñ‹Ð¿Ð»Ð°Ñ‚ Ð²Ñ‹Ð¸Ð³Ñ€Ñ‹ÑˆÐµÐ¹.ÐœÐµÐ³Ð° Ð°Ð·Ð°Ñ€Ñ‚Ð½Ð¾Ðµ Ð¾Ð½Ð»Ð°Ð¹Ð½ ÐºÐ°Ð·Ð¸Ð½Ð¾ Ð¤Ð°Ñ€Ð°Ð¾Ð½ Ð´Ð°Ñ€Ð¸Ñ‚ Ð½ÐµÐ²ÐµÑ€Ð¾Ñ�Ñ‚Ð½Ñ‹Ðµ Ð¿Ð¸Ñ€Ð°Ñ‚Ñ�ÐºÐ¸Ðµ Ð¿Ñ€Ð¸ÐºÐ»ÑŽÑ‡ÐµÐ½Ð¸Ñ� Ñ� Ð³ÐµÑ€Ð¾Ñ�Ð¼Ð¸ ÐšÑ€ÑŽÐºÐ°.Ð'Ð°Ð»Ð¾Ð²Ð°Ñ‚ÑŒ Ð·Ð° Ð´ÐµÐ½ÑŒÐ³Ð¸ Ð² ÐºÐ°Ð·Ð¸Ð½Ð¾ Ð'ÑƒÐ»ÐºÐ°Ð½ Ð¾Ñ�Ð¾Ð±Ð»Ð¸Ð²Ð¾ Ð²ÐµÑ�ÐµÐ»Ð¾ Ð² ÐºÐ¾Ð¼Ð¿Ð°Ð½Ð¸Ð¸ Ñ€Ð°Ð·Ð½Ð¾Ñ†Ð²ÐµÑ‚Ð½Ñ‹Ñ... Ð¿Ñ‚Ð¸Ñ†. <a href=https://vk.com/casinororg>Ð˜Ð³Ñ€Ð°Ñ‚ÑŒ Ð² Ñ�Ð°Ð¼Ñ‹Ðµ Ð¿Ð¾Ð¿ÑƒÐ»Ñ�Ñ€Ð½Ñ‹Ðµ Ð²Ð¸Ñ€Ñ‚ÑƒÐ°Ð»ÑŒÐ½Ñ‹Ðµ casino</a> Ð²Ñ‹ Ð¼Ð¾Ð¶ÐµÑ‚Ðµ ÐºÐ°Ðº Ð² Ð´ÐµÐ¼Ð¾ Ð²ÐµÑ€Ñ�Ð¸Ð¸, Ñ‚Ð°Ðº Ð¸ Ð½Ð° Ð½Ð°Ñ�Ñ‚Ð¾Ñ�Ñ‰Ð¸Ðµ Ð´ÐµÐ½ÑŒÐ³Ð¸. Ð�ÑƒÐ¶Ð½Ð¾ Ð¾Ñ‚Ð¼ÐµÑ‚Ð¸Ñ‚ÑŒ Ð¸Ð³Ñ€Ñƒ Ð² online ÐºÐ°Ð·Ð¸Ð½Ð¾ Ð½Ð° Ð´ÐµÐ½ÑŒÐ³Ð¸, Ð³Ð´Ðµ Ð²Ñ‹ Ð¼Ð¾Ð¶ÐµÑ‚Ðµ Ð¿Ð¾Ð»ÑƒÑ‡Ð°Ñ‚ÑŒ Ñ...Ð¾Ñ€Ð¾ÑˆÐ¸Ðµ Ð±Ð¾Ð½ÑƒÑ�Ñ‹. Ð'Ð¾Ð»ÑŒÑˆÐ¸Ð½Ñ�Ñ‚Ð²Ð¾ Ð²Ð¸Ñ€Ñ‚ÑƒÐ°Ð»ÑŒÐ½Ñ‹Ñ... ÐºÐ°Ð·Ð¸Ð½Ð¾, ÐºÐ¾Ñ‚Ð¾Ñ€Ñ‹Ðµ Ð²ÐµÐ´ÑƒÑ‚ Ñ�ÐµÐ±Ñ� Ñ‡ÐµÑ�Ñ‚Ð½Ð¾, Ð¿Ñ€ÐµÐ´Ð¾Ñ�Ñ‚Ð°Ð²Ð»Ñ�ÑŽÑ‚ Ð±ÐµÐ·Ð´ÐµÐ¿Ð¾Ð·Ð¸Ñ‚Ð½Ñ‹Ðµ Ð±Ð¾Ð½ÑƒÑ�Ñ‹. Ð£ Ð¸Ð½Ð¾Ñ�Ñ‚Ñ€Ð°Ð½Ð½Ñ‹Ñ... Ð¿Ð»Ð°Ñ‚Ñ„Ð¾Ñ€Ð¼ Ñ€ÐµÐ¿ÑƒÑ‚Ð°Ñ†Ð¸Ñ� Ð¾Ñ†ÐµÐ½Ð¸Ð²Ð°ÐµÑ‚Ñ�Ñ� Ð»ÑŽÐ´ÑŒÐ¼Ð¸, ÐºÐ¾Ñ‚Ð¾Ñ€Ñ‹Ðµ Ñ‚Ð°Ð¼ Ð¸Ð³Ñ€Ð°ÑŽÑ‚. Ð*Ñ�Ð»Ð¸ Ð¸Ð³Ñ€Ð¾ÐºÐ¸ Ñ� Ð¸Ð¼ÐµÐ½ÐµÐ¼ Ð¸Ð³Ñ€Ð°ÑŽÑ‚ Ð½Ð° ÐºÑ€ÑƒÑ‚Ñ‹Ñ... Ñ�Ð°Ð¹Ñ‚Ð°Ñ..., Ñ‚Ð°ÐºÐ¸Ðµ casino Ð¾Ð±Ð»Ð°Ð´Ð°ÑŽÑ‚ Ð»Ð¸Ñ†ÐµÐ½Ð·Ð¸ÐµÐ¹. Ð' Ð¾Ñ�Ð½Ð¾Ð²Ð½Ð¾Ð¼, Ñ‚Ð°Ð¼ Ð¼Ð¾Ð¶Ð½Ð¾ <a href=https://www.facebook.com/groups/casinor.net/>Ð¸Ð³Ñ€Ð°Ñ‚ÑŒ Ð² Ð°Ð¿Ð¿Ð°Ñ€Ð°Ñ‚Ñ‹ Ð½Ð° Ñ€ÐµÐ°Ð»ÑŒÐ½Ñ‹Ðµ Ñ�Ñ‚Ð°Ð²ÐºÐ¸</a>. Ð*Ñ�Ð»Ð¸ Ð²Ñ‹ Ñ...Ð¾Ñ‚Ð¸Ñ‚Ðµ Ð½Ð° Ñ€ÐµÐ³ÑƒÐ»Ñ�Ñ€Ð½Ð¾Ð¹ Ð¾Ñ�Ð½Ð¾Ð²Ðµ Ð²Ñ‹Ð¸Ð³Ñ€Ñ‹Ð²Ð°Ñ‚ÑŒ Ð±Ð¾Ð»ÑŒÑˆÐ¸Ðµ Ð´ÐµÐ½ÐµÐ¶Ð½Ñ‹Ðµ Ñ�Ñ€ÐµÐ´Ñ�Ñ‚Ð²Ð°, Ð²Ð°Ð¼ Ð¿Ð¾Ñ‚Ñ€ÐµÐ±ÑƒÐµÑ‚Ñ�Ñ� Ñ�Ñ‚Ð°Ð±Ð¸Ð»ÑŒÐ½Ñ‹Ð¹ Ð´Ð¾Ñ...Ð¾Ð´. ÐŸÐµÑ€Ð²Ð¾Ðµ Ð²Ñ€ÐµÐ¼Ñ� Ð½Ðµ Ð²Ñ‹Ð¹Ð´ÐµÑ‚ Ð²Ñ‹Ð¸Ð³Ñ€Ñ‹Ð²Ð°Ñ‚ÑŒ Ð±Ð¾Ð»ÑŒÑˆÐ¸Ðµ Ð´ÐµÐ½ÐµÐ¶Ð½Ñ‹Ðµ Ñ�Ñ€ÐµÐ´Ñ�Ñ‚Ð²Ð°. Ð¥Ð¾Ñ‚Ñ�, ÐºÐ°Ð¶Ð´Ñ‹Ð¹ Ð¿Ð¾Ñ�ÐµÑ‚Ð¸Ñ‚ÐµÐ»ÑŒ Ð² Ñ�Ð¶Ð°Ñ‚Ñ‹Ðµ Ñ�Ñ€Ð¾ÐºÐ¸ Ñ€Ð°Ð·Ð±ÐµÑ€ÐµÑ‚Ñ�Ñ� Ñ� ÐºÐ°Ñ‚Ð°Ð»Ð¾Ð³Ð¾Ð¼ Ð¸Ð³Ñ€. Ð¡Ñ€ÐµÐ´Ð¸ Ð¿Ð¾Ð¿ÑƒÐ»Ñ�Ñ€Ð½Ñ‹Ñ... Ð°Ð²Ñ‚Ð¾Ð¼Ð°Ñ‚Ð¾Ð² ÐµÑ�Ñ‚ÑŒ Ñ�Ð»Ð¾Ñ‚Ñ‹ Ð¾Ñ‚ Novomatic, IgroSoft, Microgaming Ð¸ Ð´Ñ€ÑƒÐ³Ð¸Ðµ. In Soviet Russia, slot machines find you.Ð¢ÐµÐ»ÐµÑƒÐ³Ð°Ð´Ð°Ð¹ÐºÐ° Ñ� Ñ�Ð¸Ñ�ÑŒÐºÐ°Ð¼Ð¸Ð·Ð½Ð°ÑŽÑ‚, ÐºÐ°ÐºÐ¾Ðµ Ð¾Ñ‚Ð½Ð¾ÑˆÐµÐ½Ð¸Ðµ Ð¸Ð¼ÐµÐµÑ‚ Ð˜Ð³Ñ€Ð¾Ð²Ñ‹Ðµ Ð°Ð²Ñ‚Ð¾Ð¼Ð°Ñ‚Ñ‹ Ðº Ð¸Ð³Ñ€Ð°Ð¼.ÐœÑ‹ Ð³Ð¾Ñ‚Ð¾Ð²Ð¸Ð¼ Ð´Ð»Ñ� Ð²Ð°Ñ� Ñ�ÑŽÑ€Ð¿Ñ€Ð¸Ð·Ñ‹ ÐµÐ¶ÐµÐ¼ÐµÑ�Ñ�Ñ‡Ð½Ð¾.Ð£ Ð½Ð°Ñ� Ð²Ñ‹ Ð²Ñ�Ñ‚Ñ€ÐµÑ‚Ð¸Ñ‚Ðµ Ð²Ð¸Ð´Ð¸Ð¼Ð¾-Ð½ÐµÐ²Ð¸Ð´Ð¸Ð¼Ð¾ Ð¸Ð·Ð²ÐµÑ�Ñ‚Ð½Ñ‹Ñ... Ð¿ÐµÑ€Ñ�Ð¾Ð½Ð°Ð¶ÐµÐ¹ Ñ�Ñ‚Ð¾Ð¹ÐºÐ¾Ð¼ Ð¸Ð· Ð¼Ð¸Ñ€Ð¾Ð² Ð˜Ñ�Ñ‚Ð¾Ñ€Ð¸Ð¸, ÐšÑƒÐ»ÑŒÑ‚ÑƒÑ€Ñ‹ Ð¸ ÐŸÑ€Ð¸Ñ€Ð¾Ð´Ñ‹.Ð�Ð° Ð½ÐµÐ³Ð¾ Ð¿Ñ€Ð¸Ñ�Ñ‚Ð½Ð¾ Ð´Ð°Ð¶Ðµ Ð¿Ñ€Ð¾Ñ�Ñ‚Ð¾ Ð»Ð¾Ñ€Ð½Ð¸Ñ€Ð¾Ð²Ð°Ñ‚ÑŒ.Ð' Ñ‚Ð¾Ð¹ Ð¶Ðµ Ð¼ÐµÑ€Ðµ Ñ�Ñ‚Ð¾ Ð¾Ñ‚Ð½Ð¾Ñ�Ð¸Ñ‚Ñ�Ñ� Ð¸ Ðº Ñ�Ð»Ð¾Ñ‚Ñƒ Alchemist's Lab Ñ‚Ð¾Ð³Ð¾ Ð¶Ðµ Ð²ÐµÐ½Ð´Ð¾Ñ€Ð°.ÐŸÐ¾ ÑƒÐºÐ°Ð·Ð°Ð½Ð½Ð¾Ð¼Ñƒ Ð°Ð´Ñ€ÐµÑ�Ñƒ Ñ€Ð°Ñ�Ð¿Ð¾Ð»Ð¾Ð¶ÐµÐ½Ð° Ð±ÑƒÐºÐ¼ÐµÐºÐµÑ€Ñ�ÐºÐ°Ñ� ÐºÐ¾Ð½Ñ‚Ð¾Ñ€Ð° Â«Ð¤Ð¾Ð½Ð±ÐµÑ‚.Ð¢ÑƒÑ‚ Ñ†ÐµÐ»Ð¾Ðµ Ð³Ñ€Ð°Ð¼Ð¾Ñ‚ÐºÐ° Ñ�Ð¾ Ñ�Ð»ÐµÐ·Ð°Ð¼Ð¸ Ð¸ Ñ� Ð¼Ð¾Ð»ÑŒÐ±Ð°Ð¼Ð¸Â», -- Ð¾Ñ‚Ð¼ÐµÑ‚Ð¸Ð» Ð´ÐµÐ¿ÑƒÑ‚Ð°Ñ‚.ÐŸÑ€Ð¾Ñ‡Ð¸Ñ‚Ð°Ð² Ñ�Ñ‚Ñƒ ÐºÐ½Ð¸Ð³Ñƒ, Ð²Ñ‹ ÑƒÐ·Ð½Ð°ÐµÑ‚Ðµ Ð¿Ñ€Ð°ÐºÑ‚Ð¸Ñ‡ÐµÑ�ÐºÐ¸ Ð²Ñ�Ðµ Ð¾Ð± Ð¸Ð³Ñ€Ðµ Ð² Ñ�Ð»Ð¾Ñ‚Ñ‹.Ð¡ÐµÐºÑ€ÐµÑ‚Ñ‹ Ð¸Ð³Ñ€Ñ‹ Ð½Ð° Ñ�Ð¾Ð²Ñ€ÐµÐ¼ÐµÐ½Ð½Ñ‹Ñ... Ñ�Ð»Ð¾Ñ‚-Ð¼Ð°ÑˆÐ¸Ð½Ð°Ñ....Ð�Ð±Ð¾Ð½ÐµÐ¼ÐµÐ½Ñ‚Ñ‹ Ð½Ð°Â Ð¸Ð³Ñ€Ð¾Ð²Ñ‹Ðµ Ð°Ð²Ñ‚Ð¾Ð¼Ð°Ñ‚Ñ‹.Ð'Ñ‹Â Ð¼Ð¾Ð¶ÐµÑ‚Ðµ Ð¿Ñ€Ð¸Ð¾Ð±Ñ€ÐµÑ�Ñ‚Ð¸ Ð°Ð±Ð¾Ð½ÐµÐ¼ÐµÐ½Ñ‚Ñ‹ Ð½Ð°Â Ð¸Ð³Ñ€Ð¾Ð²Ñ‹Ðµ Ð°Ð²Ñ‚Ð¾Ð¼Ð°Ñ‚Ñ‹ Ð¿Ð¾Â Ñ†ÐµÐ½Ðµ.Ð'Ñ�ÐµÐ³Ð¾ Ð·Ð°Â Ð¼Ð¾Ð½ÐµÑ‚ÐºÑƒ Ð¾Ð½Ð¸ Ð¸Ð³Ñ€Ð°Ð»Ð¸ Ñ�Â Ð½Ð°Ð¼Ð¸Ñ€Ð°Ð·Ð²Ð¸Ð²Ð°Ð»Ð¸ Ð½Ð°ÑˆÑƒ Ð»Ð¾Ð²ÐºÐ¾Ñ�Ñ‚ÑŒ Ñ‚ÐµÑˆÐ¸Ð»Ð¸ Ð½Ð°Ð´ÐµÐ¶Ð´Ð°Ð¼Ð¸ Ð½Ð°Â Ð±Ð°Ñ�Ð½Ð¾Ñ�Ð»Ð¾Ð²Ð½Ñ‹Ð¹ Ð²Ñ‹Ð¸Ð³Ñ€Ñ‹Ñˆ.Ð"Ñ€Ð¾Ð¼Ð¾Ð·Ð´ÐºÐ¸Ðµ Ð¿Ñ€Ð¸Ð¼Ð¸Ñ‚Ð¸Ð²Ð½Ñ‹Ðµ Ð½Ð°Â Ð½Ñ‹Ð½ÐµÑˆÐ½Ð¸Ð¹ Ð»Ð¸Ñ†ÐµÐ·Ñ€ÐµÐ½Ð¸Ðµ Ð¾Ð½Ð¸ Ð¿Ð¾Ð´Ð°Ñ€Ð¸Ð»Ð¸ Ñ‡ÐµÐ»Ð¾Ð²ÐµÑ‡ÐµÑ�Ñ‚Ð²Ñƒ Ð²Ð¸Ñ€Ñ‚ÑƒÐ°Ð»ÑŒÐ½ÑƒÑŽ Ñ€ÐµÐ°Ð»ÑŒÐ½Ð¾Ñ�Ñ‚ÑŒ ÐµÑ‰Ðµ Ð´Ð¾Â Ñ‚Ð¾Ð³Ð¾ ÐºÐ°Ðº Ð²Ð¾Ð·Ð½Ð¸ÐºÐ»Ð¾ Ñ�Ñ‚Ð¾ Ð¿Ñ€ÐµÐ´Ñ�Ñ‚Ð°Ð²Ð»ÐµÐ½Ð¸Ðµ.ÐšÐ°Ð¶Ð´Ð°Ñ� Ð¿Ð¾Ñ�Ð»ÐµÐ´ÑƒÑŽÑ‰Ð°Ñ� Ð¸Ð³Ñ€Ð° Ñ�Ñ‚Ð°Ñ‚Ð¸Ñ�Ñ‚Ð¸Ñ‡ÐµÑ�ÐºÐ¸ Ñ�Ñ‚Ð¾ Ð¸Ð³Ñ€Ð° Ð½Ð°Ð¿Ñ€Ð¾Ñ‚Ð¸Ð² ÐºÐ»Ð¸ÐµÐ½Ñ‚Ð°, Ñ‡ÐµÐ¼ Ð±Ð¾Ð»ÑŒÑˆÐµ Ð¸Ð³Ñ€Ð°ÐµÑˆÑŒ, Ñ‚ÐµÐ¼ Ð±Ð¾Ð»ÑŒÑˆÐµ Ð¿Ñ€Ð¾Ð¸Ð³Ñ€Ñ‹Ð²Ð°ÐµÑˆÑŒ, Ð²Ñ�Ñ' Ð¾Ñ�Ñ‚Ð°Ð»ÑŒÐ½Ð¾ÐµÂ -- Ñ„Ð¸Ð»Ð¾Ñ�Ð¾Ñ„Ð¸Ñ� Ð¸ Ñ�Ð°Ð¼Ð¾ÑƒÑ�Ð¿Ð¾ÐºÐ¾ÐµÐ½Ð¸Ðµ.Ð"Ð»Ð°Ð²Ð½Ð¾ÐµÂ -- Ð¿Ñ�Ð¸Ñ...Ð¾Ð»Ð¾Ð³Ð¸Ñ‡ÐµÑ�ÐºÐ¾Ðµ Ñ�Ð¾Ñ�Ñ‚Ð¾Ñ�Ð½Ð¸Ðµ, Ð½Ð°Ñ�Ñ‚Ñ€Ð¾Ð¹ Ð¸ Ñ„Ð¸Ð»Ð¾Ñ�Ð¾Ñ„Ñ�ÐºÐ¸Ð¹ Ð¿Ð¾Ð´Ñ...Ð¾Ð´ Ðº Ð¸Ð³Ñ€Ðµ.